Kwahu-Tafo (E/R), July 6, GNA- The Chief of Kwahu-Tafo, Nana Ameyaw Gyensiamah, III, has appealed to the government to remove the bottlenecks facing non-governmental organizations (NGOs) in the clearing of goods donated for charity from the ports. He explained that, this would encourage NGOs abroad to send more assistance to needy communities and individuals in the country. 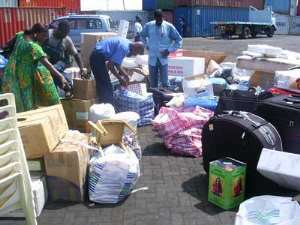 Nana Gyensiamah made the call when the Ministerial Development and Relief Programme (MDRP), a Canadian-based NGO, presented 132 boxes of assorted drugs, six bags of beans and five bags of used children's shoes, all worth 35,000 dollars, to the local community on Monday. He noted that though the items arrived in the country in January, this year, it was not until May that they were finally released to representatives of the NGO due to delays. The chief said the delays in clearing the items affected the condition and expiry date of most of the drugs, which happened to be September, this year. Nana Gyensiamah said, since the government alone could not provide the needs of the people, such assistance from NGOs would go a long way to supplement government's efforts to improve the living standards of the people. The drugs were later presented to the St Joseph's Clinic, while the beans and shoes would be distributed to needy pupils in the various basic schools and kindergartens. The Queenmother of Kwahu-Tafo, Nana Aduako Gyamfuwa and Sister Aloysita, Nursing Administrator in-charge of the Clinic thanked the donors for the items.